A peasant had a faithful horse which had grown old and could do no more work, so his master would no longer give him anything to eat and said, "I can certainly make no more use of thee, but still I mean well by thee; if thou provest thyself still strong enough to bring me a lion here, I will maintain thee, but now take thyself away out of my stable," and with that he chased him into the open country. The horse was sad, and went to the forest to seek a little protection there from the weather. Then the fox met him and said, "Why dost thou hang thy head so, and go about all alone?" "Alas," replied the horse, "avarice and fidelity do not dwell together in one house. My master has forgotten what services I have performed for him for so many years, and because I can no longer plough well, he will give me no more food, and has driven me out." "Without giving thee a chance?" asked the fox. "The chance was a bad one. He said, if I were still strong enough to bring him a lion, he would keep me, but he well knows that I cannot do that." The fox said, "I will help thee, just lay thyself down, stretch thyself out, as if thou wert dead, and do not stir." The horse did as the fox desired, and the fox went to the lion, who had his den not far off, and said, "A dead horse is lying outside there, just come with me, thou canst have a rich meal." The lion went with him, and when they were both standing by the horse the fox said, "After all, it is not very comfortable for thee here I tell thee what I will fasten it to thee by the tail, and then thou canst drag it into thy cave, and devour it in peace." This advice pleased the lion: he lay down, and in order that the fox might tie the horse fast to him, he kept quite quiet. But the fox tied the lion's legs together with the horse's tail, and twisted and fastened all so well and so strongly that no strength could break it. When he had finished his work, he tapped the horse on the shoulder and said, "Pull, white horse, pull." Then up sprang the horse at once, and drew the lion away with him. 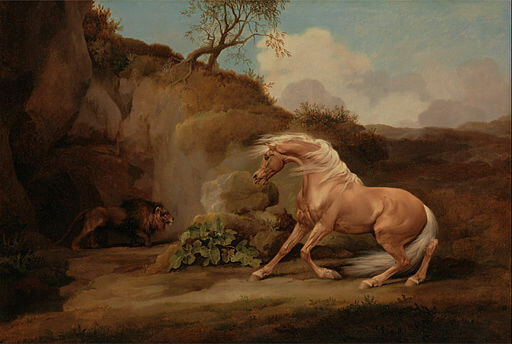 The lion began to roar so that all the birds in the forest flew out in terror, but the horse let him roar, and drew him and dragged him over the country to his master's door. When the master saw the lion, he was of a better mind, and said to the horse, "Thou shalt stay with me and fare well," and he gave him plenty to eat until he died. Add The Fox and the Horse to your own personal library.